Roman J. Israel is the kind of eccentric character that only exists in the movies. 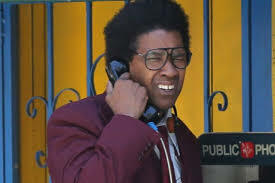 Donning oversize wire-rimmed glasses, an afro and clunky earphones around his neck, the criminal defense attorney looks like he was just transported to Los Angeles from a 1970s portal. Wait! He can recite obscure statutes by heart and what he doesn’t know he stuffs into a giant suitcase. He avoids eye-contact and stammers in his speech. A Civil Rights-era throwback, Roman is fiercely against plea-bargain justice and fights for social rights. 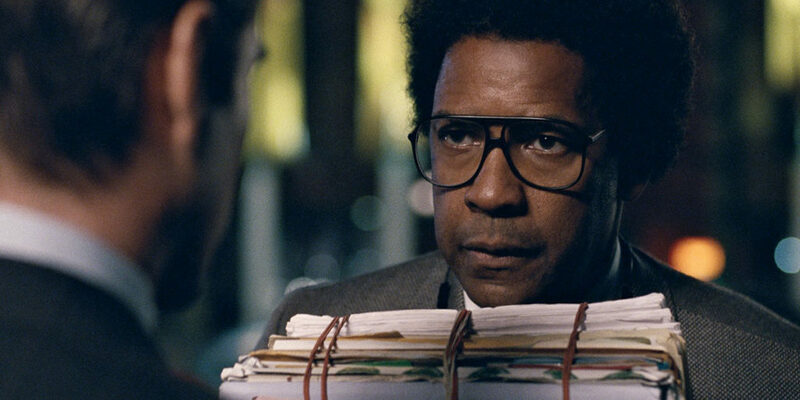 I can see why star Denzel Washington was drawn to the role. He’s already played the hot shot attorney in Philadelphia. Now he gets to be the unpredictable — but super-smart! — wild card, standing out from the pack of the tailored suits and careening up and down and up a redemptive character arc. But not even one of the greatest, most charismatic actors of the past 30 years can make a Picasso out of a dull, by-the-numbers drama. For years, Roman was known as the righteous “man behind the curtain” at his own small firm. Then his partner has a debilitating heart attack. Roman thinks he can handle being the new face of the firm. 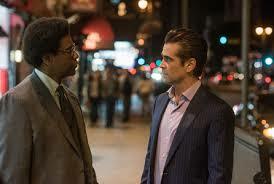 Instead, he’s forced to work for a slick attorney (Colin Farrell, underused) at his corporate firm that reels in big money. The move is as ill-fitting as one of his double-breasted suit jackets. He just doesn’t do watercooler talk. How will he survive and thrive? That set-up would make for an intriguing TV pilot on Showtime. Surefire Emmy nomination for the actor playing the high-maintenance title character. (He insists on the fancy esquire in his title.) As a two-hour film, it feels episodic because of its lack of focus. At his new firm, Roman tries to work with a non-profit. The problem is he’s also out of step with the identity politics of the young volunteers. His discovery of a seemingly dead man in the street erupts into a potentially violent confrontation with two officers. Then, at the film’s midpoint, he decides to break a few rules and literally cash in for reasons that I still don’t quite understand. It finally picks in the third act, but the pacing shift is jarring. And the desperate grab for a satisfying conclusion leads to more loose ends. Writer-director Dan Gilroy’s most recent outing, the excellent 2014 neo-noir Nightcrawler, also explored the life on an idiosyncratic L.A. loner (Jake Gyllenhaal) living in the shadows. With great power comes great corruption. But Gilroy never finds his rhythm in his follow-up, and it shows. With a lack of confidence behind the camera, the film comes a half-hearted morality tale. I wasn’t even convinced the movie was set in Los Angeles. Could have been Anywhere, USA. One other big difference between the two films: Whereas Gyllenhaal disappeared into the role of shady TV cameraman in Nightcrawler, the great Washington fails to hide his innate domineering screen presence. Roman has been beaten down by life to the point where he calls a city hotline several times a night to complain about neighborhood noise. Washington is just too powerful a force to sell it. I was constantly aware that I was watching him play someone. I had the same issue last year when Ben Affleck tried a similar character in The Accountant. Some movie stars just aren’t meant to play genius introverts. When a film meanders too much, it fails to make much of an impact. Like Roman J. Israel, Esq., I predict this will move back into the cinematic shadows all too soon.